From shocking Wikileaks revelations about Satanism in the US Capitol to the connection between witchcraft, the Babylon working, spirit cooking, and the Fourth Turning Grey Champion. 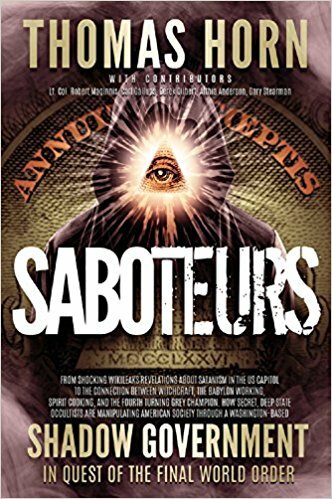 How secret, Deep State occultists are manipulating American society through a Washington-based shadow government in quest of the Final World Order. If Rick Wiles is the Christian media Alex Jones, Horn is the Christian media David Icke, blending Christian fundamentalism with fantastical conspiracy theories about UFOs, hybrid entities and other concepts that owe much more to pulp science fiction than historic Christianity. However, he’s not an outlier – he makes regular appearances on The Jim Bakker Show; his writings appear on websites such as WND and Charisma News; and his media enterprises Defender Publishing and Skywatch TV link him into wider networks. Last year I noted a Defender book called I Predict, in which he heads a cast of contributors that includes Mark Biltz, who achieved fame with his “Blood Moons Tetrad” End-Times theory, and Joel Richardson, who has written two books (endorsed by Robert Spencer) predicting an “Islamic Antichrist”. Maginnis is a conservative pundit who has made numerous appearances on mainstream media as a “national security and foreign affairs” specialist, based on his military background and former role at the Pentagon – during the Bush II years, he was part of Department of Defense military analyst group convened by Donald Rumsfield. He has been a columnist for Human Events, and vice president for policy at the Family Research Council. His 2015 book Never Submit: Will the Extermination of Christians Get Worse Before It Gets Better? (also published by Defender) came with cover blurbs by Col. “Jerry” Boykin (previously blogged here) and Franklin Graham. Maginnis is also described as a “regular broadcast partner” on Jimmy DeYoung’s radio show Prophecy Today, and he has made appearances on The Jim Bakker Show and on Skywatch TV. Back in April, he appeared on Skywatch TV to discuss “the occult influence on DC elites”, in which he railed against “witchcraft” and “homosexuality” in Washington. Saboteurs places Maginnis alongside Carl Gallups, who infamously dismissed and mocked grieving Sandy Hook parents as “Hollywood actors” – there was some controversy when he led prayers at an election rally for Trump last year. The other authors are all regular collaborators with Horn; I previously noted Gary Stearman – author of Time Travelers of the Bible: How Hebrew Prophets Shattered the Barriers of TimeSpace (Defender again) – here. There will also be a tie-in TV series. Horn’s interest in what “Rabbis in Israel” supposedly believe about Trump was noted by Right Wing Watch in December; Horn now complains that the site conflated this what he himself believes, although it’s clear from the video that Horn was enthused by the Rabbis’ alleged interpretations and that he regards them as supernaturally significant. Horn’s impenetrable ruminations on “the Fourth Turning and the Grey Champion” (aspects of a theory of historical change introduced by William Strauss and Neil Howe in the 1990s, which apparently influences Steve Bannon’s thinking) were recently published on WND. I looked at conspiracy theories about “Satanism in the US Capitol” related to “spirit cooking” back in November.